I’ve summarized my experience in SEVEN simple pointers. It is the building nearer to the Marina South Pier MRT Station, not the fancy looking Marina Bay Cruise Center which is for cruise ships. No idea how I got confused with the names and my poor friend walked to the wrong building as a result.. With the opening of the Marina South Pier MRT Station (Nov 2014), it is a breeze to travel there via public transport. When boarding the red line, do pay attention as some trains end at Marina Bay instead. It is usually on an alternate basis. If you’re feeling hungry or forgot to pack food, there’s a mini provision shop selling tibits, snacks and drinks and another food place selling Nasi Lemak, roti prata etc. Check the departure timings from Singapore Island Cruise’s website. Schedule below is accurate as at August 2016. Try to be punctual as if you miss the ferry, there’s nothing more than a mini provision shop and a food stall. Do note that online booking is not available and tickets sell on first come first serve basis at a counter at the terminal. There is a possibility that tickets may sell out on popular dates so it is best to be as early as possible. For the rarest time ever (probably the earliest we’ve ever met), we were able to catch the 9am ferry. For children under 12, tickets are priced at $12. We didn’t have time to walk to the other side of the island to snap some photos. Oh, and if you are a cat lover, there’s an area with a lot of cats in St John’s island. There were at least 5 to 6 cats just lazing around in the shade waiting for humans to play or take photos of them. Not too sure if you should be feeding them though. Don’t think there were any disclaimers. I’ve heard about the wonders of Lazarus Island from the lucky ones that have been on a private yacht to the island. Before this trip, I never knew that Lazarus Island was so convenient! It was only a short 300 to 400m walk away from St John Island! By the way, the paths in these islands are pretty flat and smooth – baby strollers/wheelchairs shouldn’t be much of an issue. This area is a popular fishing spot too. Even though we were on the first public boat from Singapore to St John Island, there were already people fishing when we reach. Not sure if they had their private transport to this island or they camped overnight. This island is truly a “Laid-back Charm“. The Crescent beach (with fine sand) and clear waters makes you feel very relaxed and at peace. It’s hard to believe that you’re still in the same country. When we first reach the beach, we were the only ones apart from that random yacht docked close to shore. We went towards the end of the breakwater and basked in the sun for quite some time, doing nothing; just spacing out and taking photos and spending time on social media. It would be desirable if I can reduce the extent of social media in such situations but the island’s reception was way too good. We did not enter the water as we were all wearing shoes. Maybe next time (probably years later) I will consider bringing slippers so I can at least dip my feet in the sea. 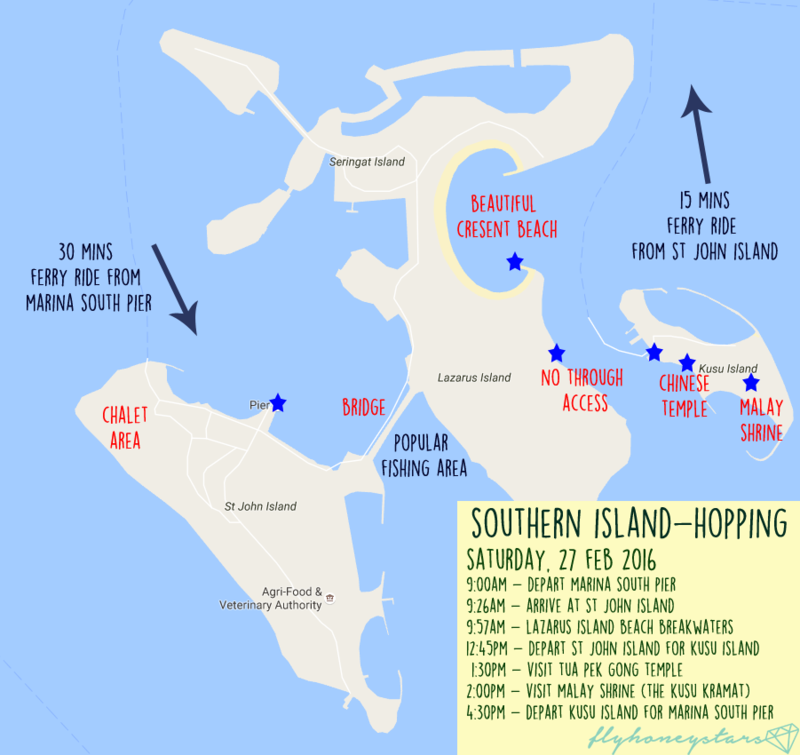 Do note that there are no toilet or shower facilities at Lazarus Island. You will have to walk back to St John Island. Brought my two mini bears along for the adventure. It was pretty sad to see debris along the beach even though this was such an isolated area. We could see Kusu Island (looks really tiny) from the distance and we were wondering if we could swim over during low tide. Just kidding. Despite being only 85,000 sqft or rather the size of 13 football fields, Kusu Island (Which means Tortoise in Chinese) is actually the most popular island among the three. It is home to a famous Chinese Temple which attracts huge crowd during the Ninth Lunar Month and a Malay Shrine which requires you to walk up 152 steps. This is the only island (among the three) where you can purchase food and canned drinks at the temple. It is also the most “commercialized” island with fun stuff like a wishing well. We don’t have much of such stuff in Singapore so it was fun trying to aim your coin at the 3 bells in the middle of the lotus flower. We emptied all the coins in our wallet in the process. I’m not really sure what this Food Centre is for but I suppose that it will be occupied during the Ninth Lunar Month when there will be crowds of people. Behind the food center, you will find the toilets and this yellow railings and steps that will bring you up. After walking down (a different stairs), we were greeted with beautiful views of the ocean, albeit not as beautiful as Lazarus Island. Spot MBS & Singapore Flyer! Lonely random tree that can possibly be a good backdrop for wedding photoshoots. There was a long breakwater too but this was a little low and unstable. We did not walk out to the end unlike the one in Lazarus. Just space out.. and hear the waves crashing in. When was the last time you last appreciated the sounds of nature? Ample land available for picnic. Not sure if Kite flying is allowed on this island but it should be easy with the strong winds. Kusu Island is really a small island. I think it takes maximum 20 minutes to walk one full round around the island. In fact, we had too much time on the island and we just ended up seeking shelter under this random pavilion while waiting for the ferry timing. It was definitely an interesting day trip out of mainland Singapore. To be honest, I haven’t been spending much effort in exploring my own country as compared to my overseas adventure but I’ll try to visit more and write more about Singapore, especially on the hidden gems and places that people don’t always visit! Hope you enjoyed reading and feel free to share your experience or anything that I might have missed out!